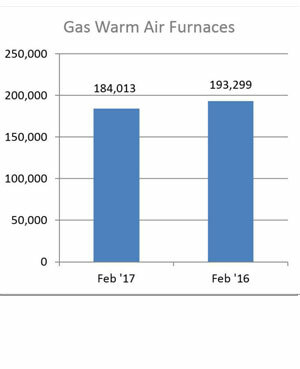 U.S. shipments of residential gas storage water heaters for February 2017 increased 5.5 percent to 372,724 units, up from 353,287 units shipped in February 2016. 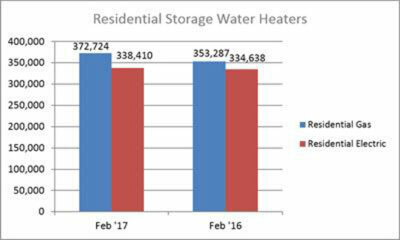 Residential electric storage water heater shipments increased 1.1 percent in February 2017 to 338,410 units, up from 334,638 units shipped in February 2016. For the year-to-date, U.S. shipments of residential gas storage water heaters increased 3.7 percent to 732,857, compared to 706,995 shipped during that same period in 2016. Residential electric storage water heater shipments increased 6.1 percent year-to-date to 695,804 units, compared to 655,703 shipped during the same period in 2016. Commercial gas storage water heater shipments increased 3.4 percent in February 2017 to 8,953 units, up from 8,662 units shipped in February 2016. 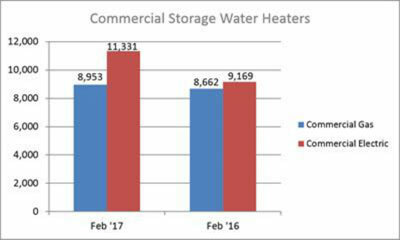 Commercial electric storage water heater shipments increased 23.6 percent in February 2017 to 11,331 units, up from 9,169 units shipped in February 2016. Year-to-date U.S. shipments of commercial gas storage water heaters decreased very slightly to 15,785 units, compared with 15,787 units shipped during the same period in 2016. Year-to-date commercial electric storage water heater shipments increased 33.7 percent to 21,876 units, up from 16,365 units shipped during the same period in 2016. 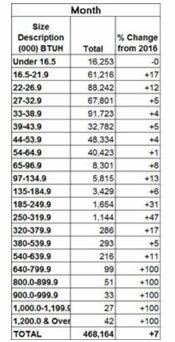 U.S. shipments of gas warm air furnaces for February 2017 decreased 4.8 percent to 184,013 units, down from 193,299 units shipped in February 2016. 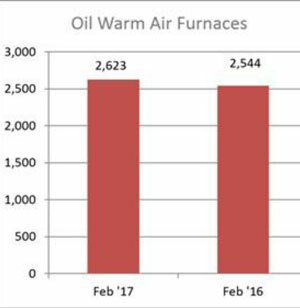 Oil warm air furnace shipments increased 3.1 percent to 2,623 units in February 2017, up from 2,544 units shipped in February 2016. 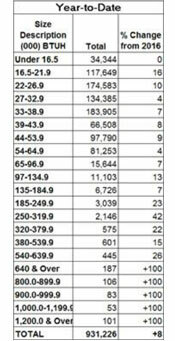 Year-to-date U.S. shipments of gas warm air furnaces increased 7 percent to 416,010 units, compared with 388,647 units shipped during the same period in 2016. Year-to-date U.S. Shipments of oil warm air furnaces decreased 5 percent 5,593 units, compared with 5,888 units shipped during the same period in 2016. U.S. shipments of central air conditioners and air-source heat pumps totaled 468,164 units in February 2017, up 7 percent from 437,420 units shipped in February 2016. U.S. shipments of air conditioners increased 6.2 percent to 292,446 units, up from 275,381 units shipped in February 2016. U.S. shipments of air-source heat pumps increased 8.4 percent to 175,718 units, up from 162,039 units shipped in February 2016. 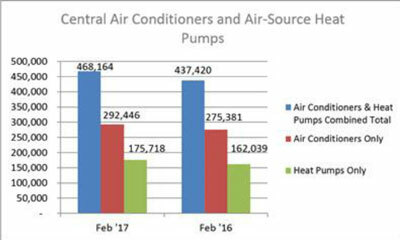 Year-to-date combined shipments of central air conditioners and air-source heat pumps increased 8.1 percent to 931,226 units, up from 861,522 units shipped in February 2016. Year-to-date shipments of central air conditioners increased 5.9 percent to 564,400 units, up from 532,997 units shipped during the same period in 2016. The year-to-date total for heat pump shipments increased 11.7 percent to 366,826 units, up from 328,525 units shipped during the same period in 2016.